Together’s Night Time Marine Magnesium is a relaxing formulation to help you feel rested and restored. Along with all the benefits of their much-loved OceanPure Magnesium, they’ve added a carefully selected combination of premium hops extract and natural 5-HTP from Griffonia extract. Snuggle down with this new bedside companion. Together’s Magnesium is complete, containing the 5 natural forms. Our bodies are able to recognise minerals with ease when they’re taken from natural sources, rather than synthetically created. This means that we identify and absorb all that natural goodness far more effectively. Take two capsules daily 30 minutes prior to sleep, take as a food supplement with or without food. 100% plant based vegicap may be split and powder mixed with food or drink. Below are reviews of Together OceanPure Night Time - 60 Capsules by bodykind customers. If you have tried this product we'd love to hear what you think so please leave a review. 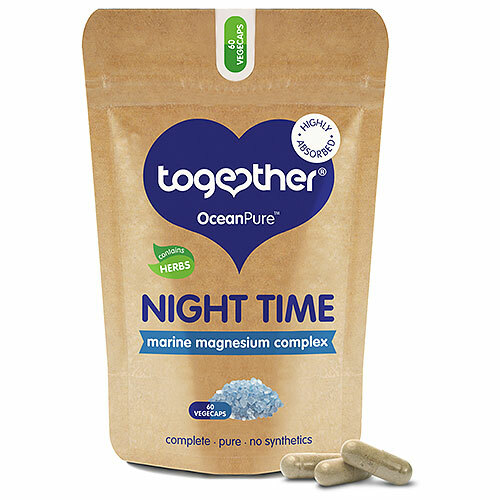 Together’s Night Time Marine Magnesium is a formulation to help you feel rested and restored. Along with all the benefits of their OceanPure Magnesium, they’ve added a combination of premium hops extract and natural 5-HTP from Griffonia extract.